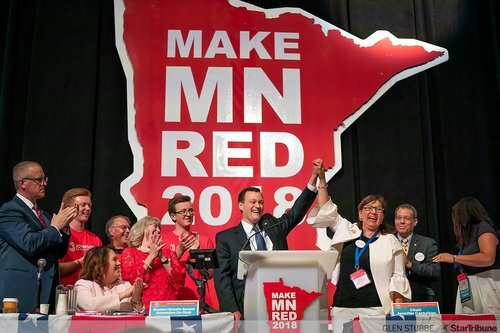 Where will Rebecca Otto's votes go now? We'll know soon. now look for tpaw forces to go heavily for parrish, to keep him in the game. 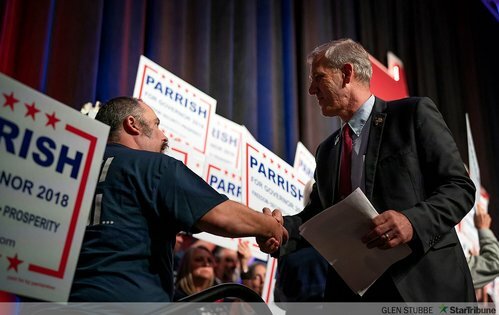 if parrish is below 20 in the next round, he drops. People banging on something or rather caused a wire to slip and was the reason for the clicker problems. 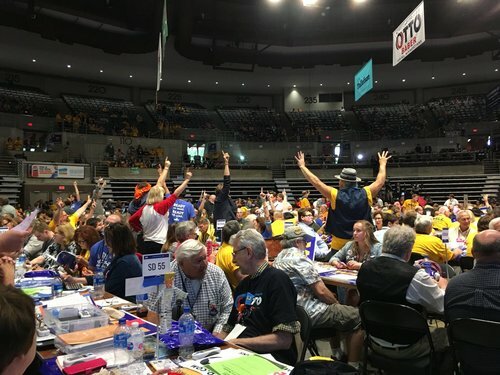 These delegates are just too excited. 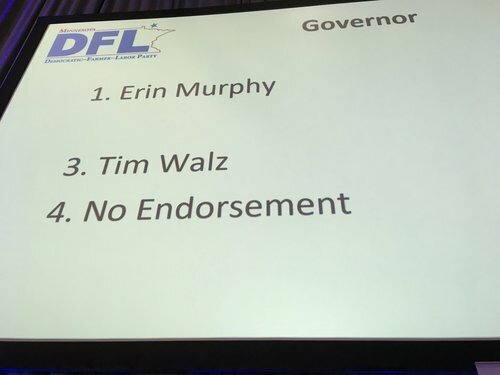 Latest ballot: Murphy 52.5 percent, Walz 46.7 and no endorsement .08 percent. 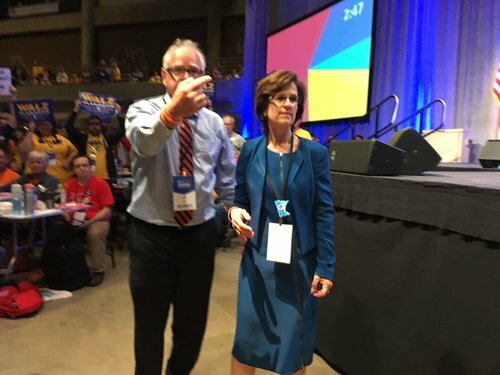 Walz, Otto walked in together to the Beatles' "Come Together." 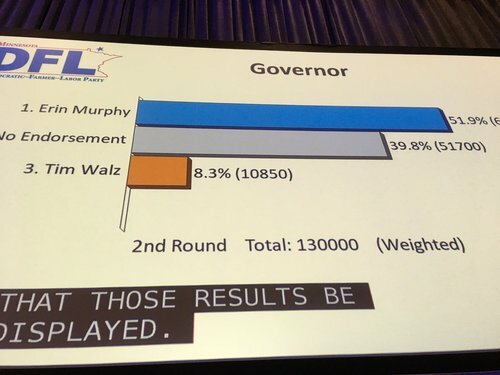 Walz parading through hall with four fingers upheld on each hand - encouraging delegates to opt for #4 vote, no endorsement. 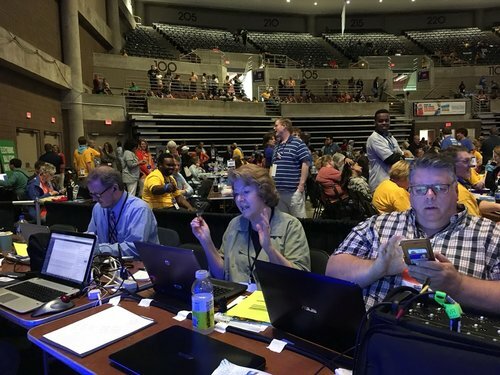 Sondi Johnson looked over at her husband Jeff and smiled as they watched a promotional video about Jeff's life and candidacy. In the middle are their sons Thor and Rolf. 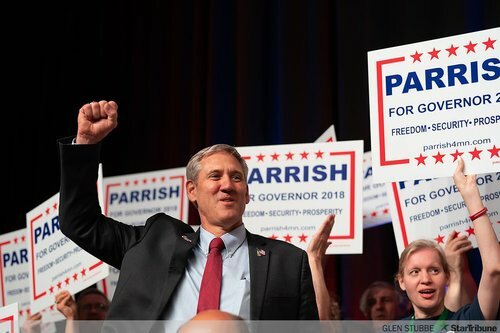 Republican candidate for Governor Phillip Parish thanked his volunteers as they climbed to the stage to cheer him on. 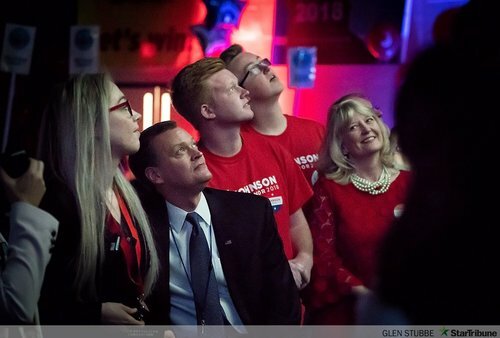 Republican candidate for Governor Mary Giuliani Stephens listens as her dad talks about what a great Governor she would make. 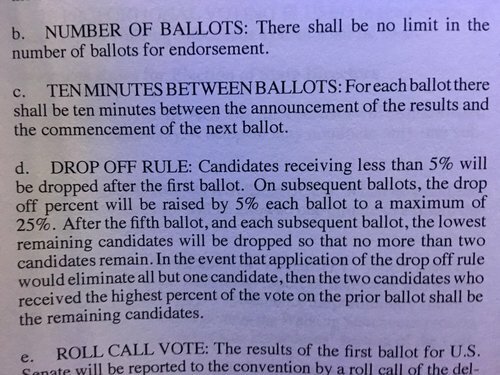 After a rules fight, campaigns are allowed to send electronic information during balloting. 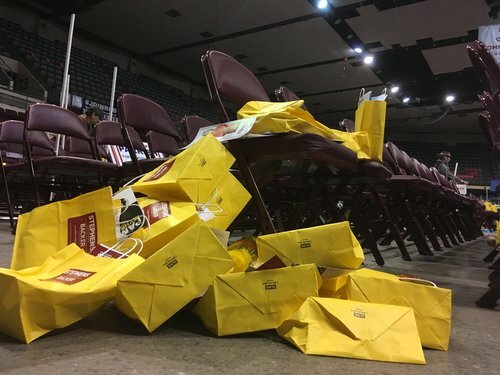 They can't distribute campaign lit, but the big question was: Does electronic info count as campaign lit? Decision: No. 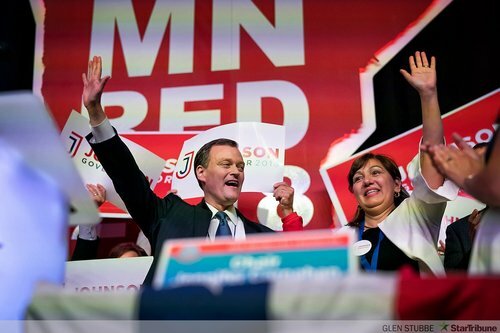 jeff johnson endorsed by standing affirmation. 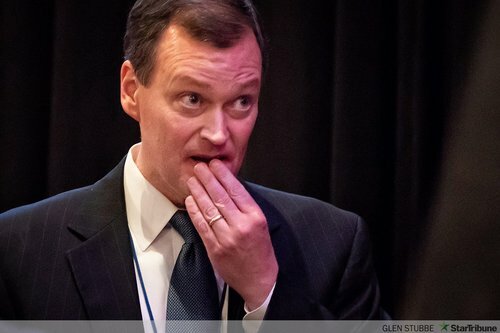 “Let's work through this, let’s slog through this, let’s endorse a candidate," Martin said, and if there's no endorsement the party cannot spend "money, time or energy" working for a candidate this summer. 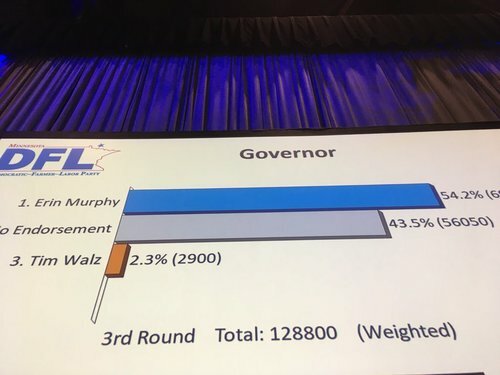 Murphy has 58.7 percent in latest ballot, some calls of “1.3” from her supporters. 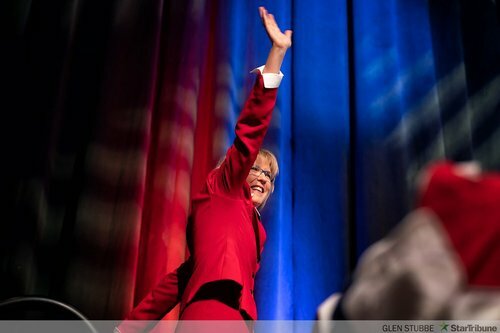 She has to reach 60 percent to get party’s endorsement. 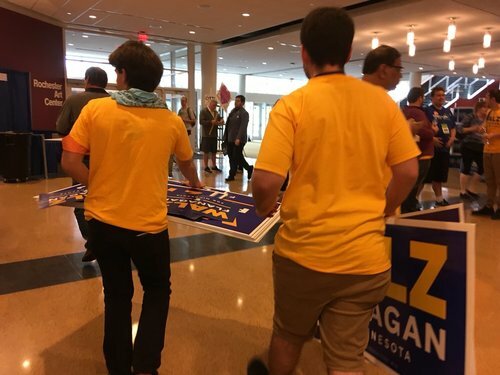 “I still believe that we will win,” Walz supporters say. 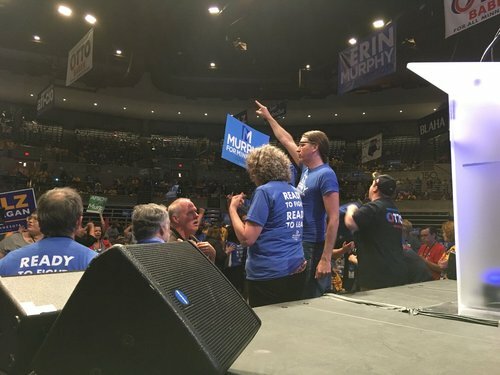 He has planned to continue to primary with/without endorsement.